Hook yourself up the correct way by wearing your Belvedere shoes with their matching exotic skin belts. 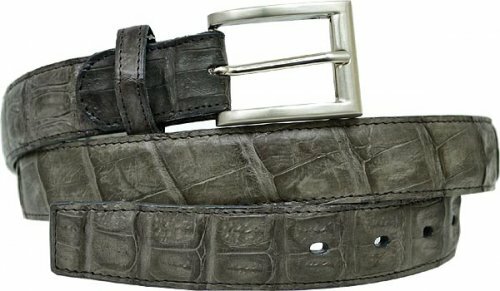 Belvedere belts are made in all of the same exotic skin leathers like crocodile, ostrich skin and lizard skin all ready to match with your shoes. Get ostrich leg skin in Gray, Navy, Black, Brown and Red to show your colors off. The bumpy texture will show people that you're belt is made of nothing but real ostrich quill skin. Available in Black, Brown and White. Slippery and smooth is one way to describe the exotic skin of genuine eel skin when it's made into a luxury belt. Now available in Black,Brown, Navy and Green to match all of the Eel skin Belvedere shoes. If you have lizard skin shoes, you'll need a lizard skin belt to match. Belvedere and Contempo Suits has got you covered. Available in White, Burgundy, Gray, Brown, Navy Blue, Olive and Black of course. The first time you touch stingray skin you'll feel something like you've never felt before. It's micro bumps just emphasizes the exotic skin nature of this belt. Get them in Gray, Navy Blue, Black, Brown and bright Red.